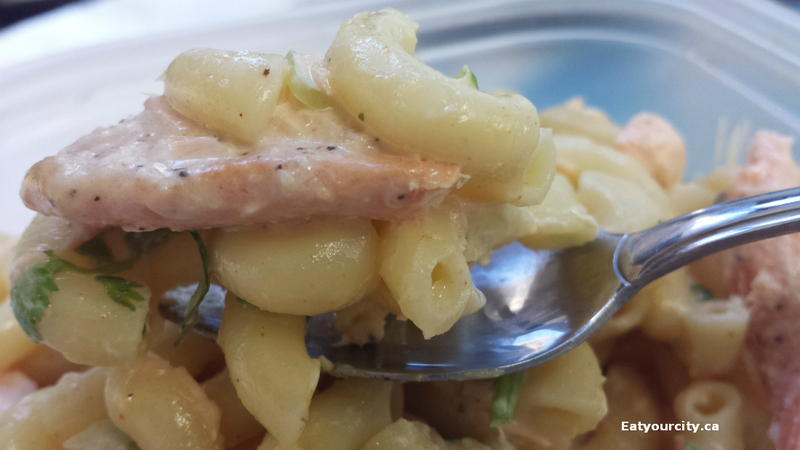 Eat Your City: Grilled salmon macaroni salad recipe and traditional macaroni salad recipe! 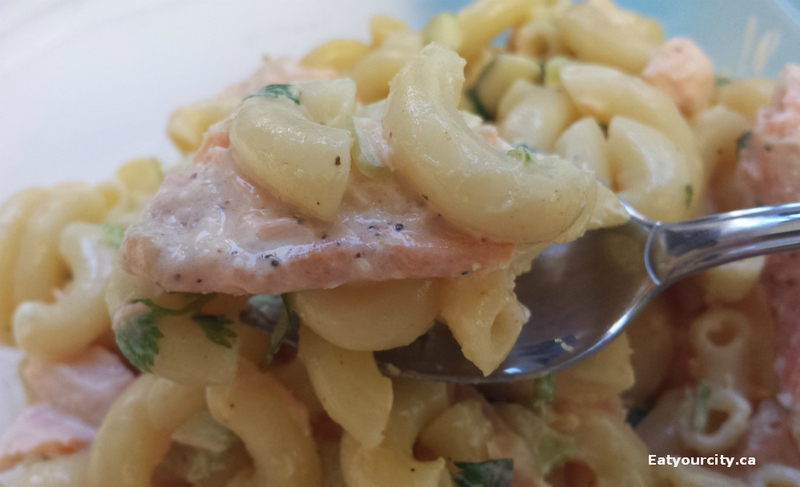 Grilled salmon macaroni salad recipe and traditional macaroni salad recipe! Posted by One of my favorite pasta salads year round has to be the humble macaroni salad. Its super easy to toss together and makes a great side or meal. It resembles nothing to the limp sad ones you see at buffet tables when you were a kid... macaroni salad recipe I have below is a taste of summertime fun and the grilled salmon version is a tasty twist on the classic... and a great way to use up leftovers! Just remember, just as with any other salads made with mayo or miracle whip, keep refrigerated and toss in the garbage if its been sitting out longer than 2 hours. One of the things I love about macaroni salads is how forgiving it is - if you don't have macaroni, you can swap it out with practically any type of pasta. You can toss in any type of fresh herb you have in the fridge, or add in crispy cut up veges and its a completely new spin on the salad. So feel free to jazz things up your way or stick with the traditional you can't go wrong macaroni salad! For the gluten free folks, I have a list of GF mayonnaises at the bottom of the post! And yes, if you're wondering, I totally took a pic of it while it was in my tupperware for lunch hahahaha!! 2) In a large mixing bowl, combine the mayonnaise or Miracle Whip with the spices of choice, then add in cooled pasta, protein choice and fresh herbs. Mix well. Top with toppers of your choice, pop in fridge to cool it and let flavors marry for at least 30min. Best Foods/Hellman's Mayonnaise - look for gluten free marked on label. Blue Plate Mayonnaise- look for gluten free marked on label.